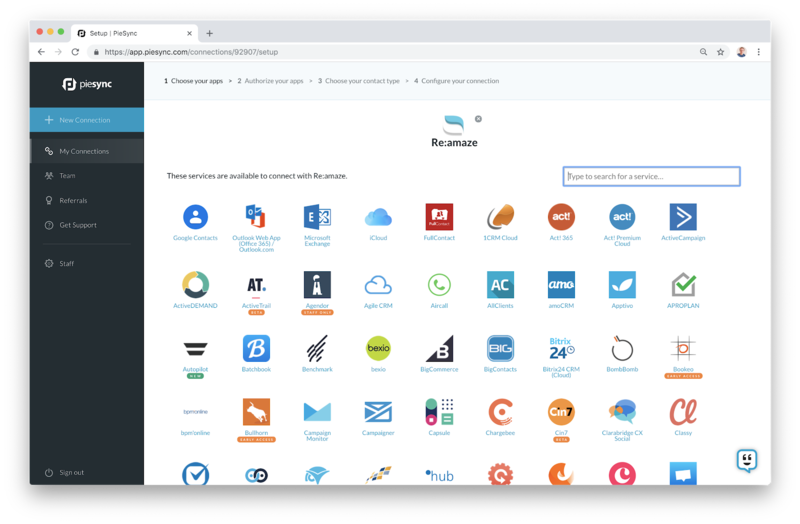 The PieSync integration for Re:amaze allows you to dynamically sync customer data and contact information between Re:amaze and hundreds of other cloud-based applications using advanced rules and Intelligent 2-way syncing. 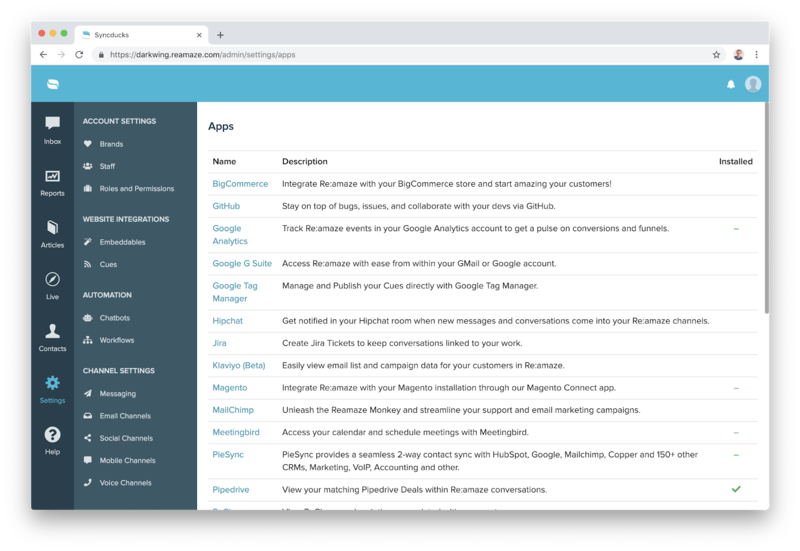 When you connect Re:amaze to PieSync and another app you want to connect with, your contact fields in Re:amaze are populated automatically. 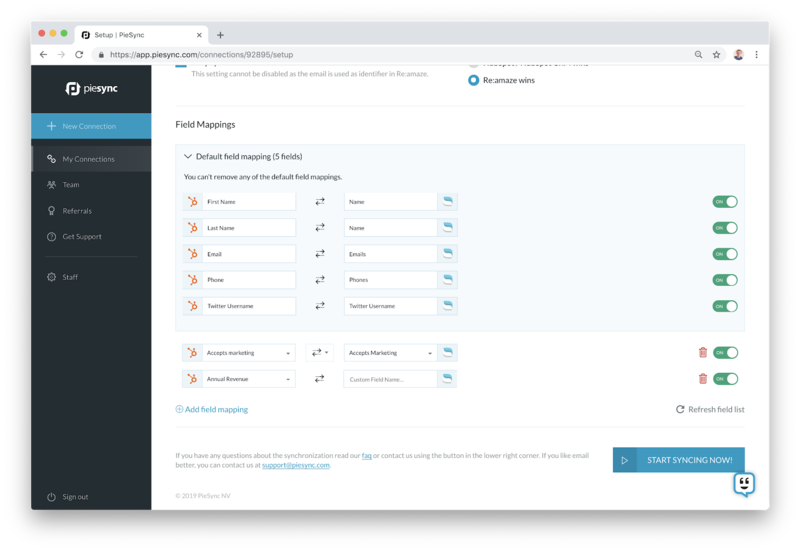 PieSync’s field mapping algorithm will attempt to automatically map the fields. You can also manually change field mappings or create new field mappings for entries not already listed. Create custom rules for advanced situations where a one-way sync simply isn't enough. 2) Enter your email address to get started (this will direct you to the passwordless/otp/social login). You can also choose to already select a combination from the previewed selection. 3) If you entered your email address, you will receive a single sign on code to login. 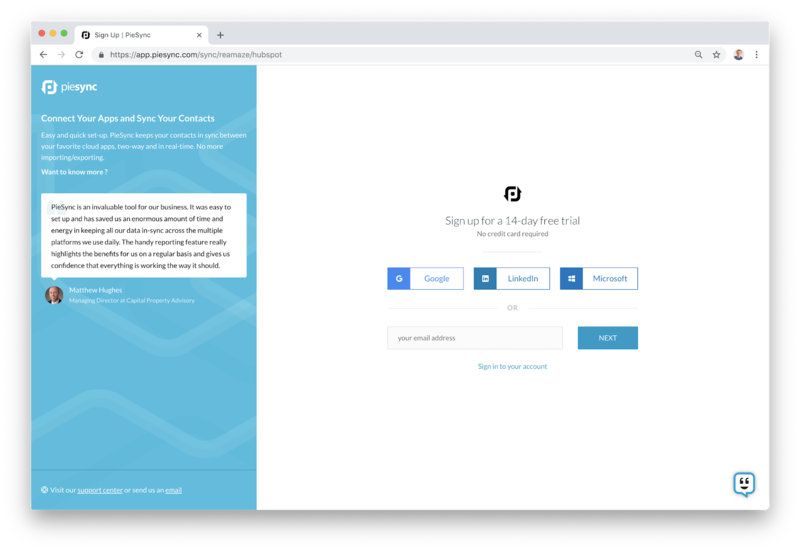 If you selected a specific connection, you will be asked to login or create a new account. 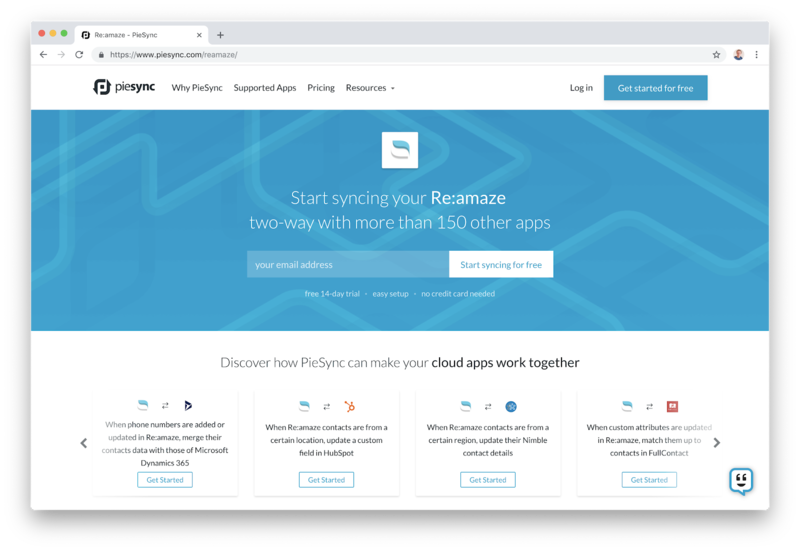 4) If you did not select a combination in the website journey prior, PieSync will allow you to select the secondary application that you’d like to connect with Re:amaze. 5) If you have already selected a combination, you will be directed to the authentication window immediately. Here you have to ‘Add a new account’ or ‘Choose an existing account’. The following screenshot shows that in the past, an account had already been authorized. 6) If no account had been authorized before, you’ll have to "Add a new account". A pop-up window will ask for more details (Subdomain, Email Address and API Token) to authorize the applications. See next screenshot for more details about where you can find this information. 7) After authorizing your primary application, we’ll also need you to authorize your secondary application. 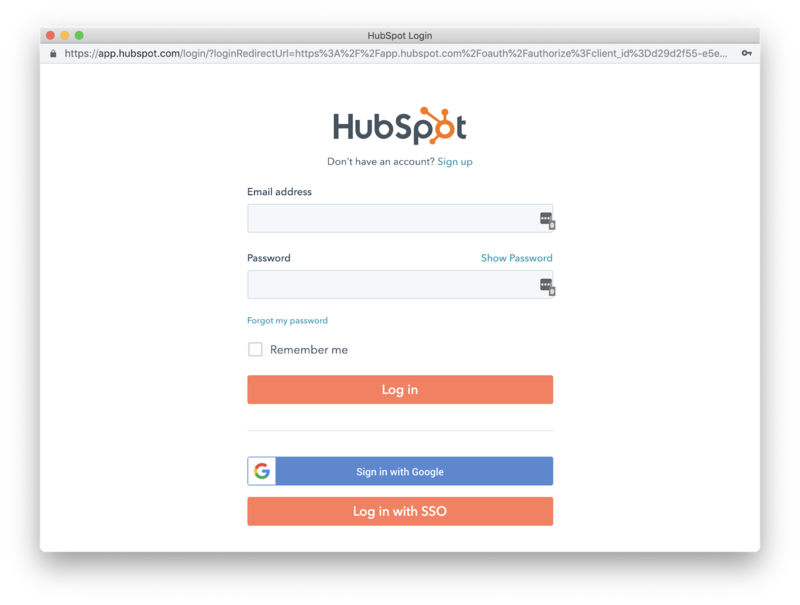 In the example of HubSpot, you need to enter your login credentials. - "Connection Rules": Should all data sync, or only subsets? Workflows to be applied? - "Field Mapping": How should data be exchanged between the two apps? 9) "Connections Rules" are the two rules that represent the bi-directional sync. Either can be disabled to allow for a 2 way sync where only one app feeds into the other. 10) By using Filters, you’ll be able to filter on subsets of contacts based on contact data in your Re:amaze applications or your secondary application. Actions allow you to set up workflows in the sync. The same filters, you can also use to apply actions and update data in the connected app. The relevance of this feature is currently limited for Re:amaze. 12) "Field Mappings" are crucial for a successful Re:amaze sync. 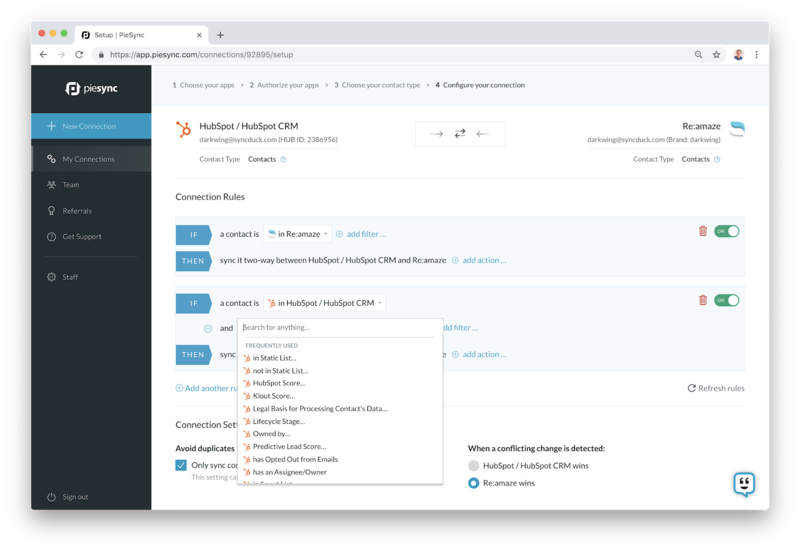 Additional fields can be mapped alongside the default contact schema fields. 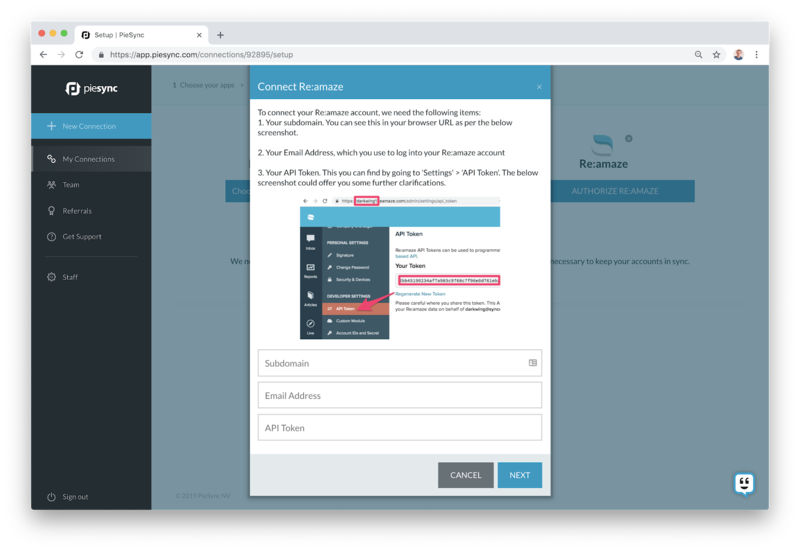 This is where CRM data can be moved over into Re:amaze’s custom contact attributes. 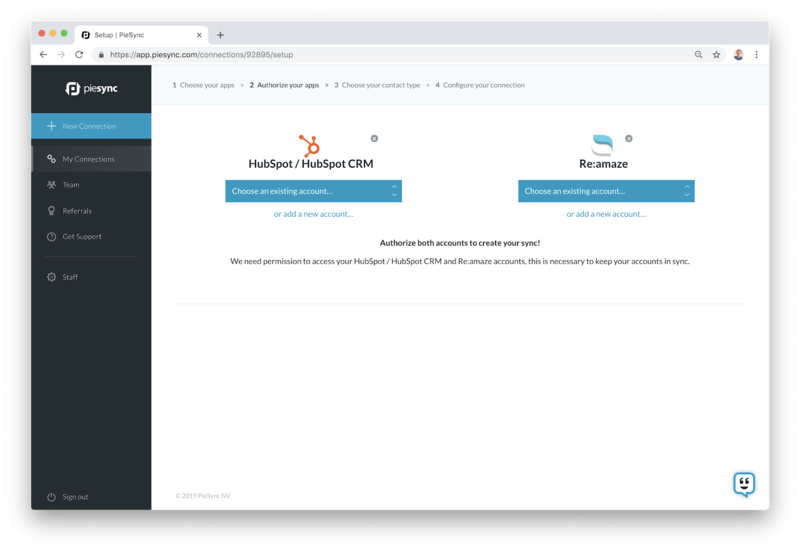 13) After you’ve set up the sync, PieSync offers a dashboard that allows you to follow up with the current status of the integration. The sync runs automatically every 5 minutes, or faster when PieSync has registered to webhooks being sent out by the app. 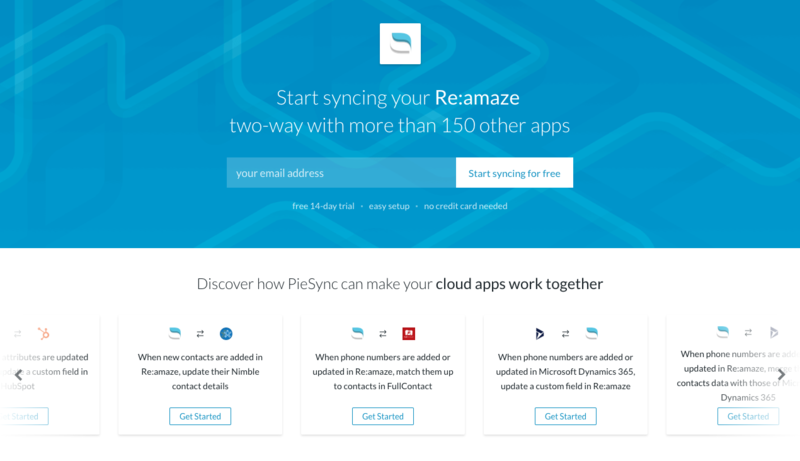 You can find the PieSync integration by going to the app section of your Re:amaze account. You can read the original announcement here.